The information below is for employers that participate with the SHBP or SEHBP only. Looking for Pension information? The Employer Health Benefits billing statement shows recent activity to your account. Payment Due Statement — Indicates the name and ID number of the employing agency, the payment amount, due date, and information on submitting payments through TEPS. Billing Type and Group — Indicates the type of employer (State/Local) and the health benefits group (Active/Retired/COBRA) to which this billing applies. General Information — Name and ID number of the employing agency, the billing date, and the time period covered by the current bill. Premium Delay — Any premiums that are delayed, the delayed due date, and any premiums credited as of the billing date. Employers with "Active" coverage have the option to select a 30- or 60-day premium delay. Opening Balance — Total unpaid premium balance as of the last billing statement date. This balance does not take premium delay into account. Payments and Adjustments — Payments or other credits or adjustments received or applied between billing dates that result in an adjusted balance. A message will be shown to explain any credits or adjustments that are made to the bill. Interest — "Active" health coverage is subject to interest if the payment made comes in 15 or more days after the premium due date. The premium due date will either be the 15th of the current month or 30 or 60 days later if premium delay has been selected. The interest penalty for late payments is charged at the time of the payment at one percent above the average annualized daily rate of return on the State Cash Management Funds as published by the Division of Investment for the most recent fiscal year. Adjusted Balance — The amount due after any payments and adjustments made between billing dates. Past Due Premiums — A monthly breakdown by type of plan (Health/Prescription) with up to three months detail for any overdue premiums as of the current billing date. Current Monthly Charge — A list of the total premiums by type of plan (Health/Prescription) due this billing cycle and any payments or adjustments credited to them. This area will also show interest charges/payments. Closing Balance — Total premiums due up to the current coverage period regardless of any premium delay that may exist. Total Payment Due — The amount due with the current billing statement. Please pay this amount by the due date to keep your account current. A separate payment should be remitted for each billing statement you receive. Please do not include any additional paperwork with your remittance and payment stub. Certification — The billing statement includes a declaration and certification by the Deputy Director of Finance which can be used as the purchase order voucher. Message Box — This area is used for information about credits, adjustments, and for special messages from the SHBP or SEHBP. Billing Questions — For your convenience each bill includes a telephone number for billing questions only. To ensure accuracy of coverage for employees and retirees, the reports generated should be audited by the employer, and any discrepancies reported immediately to the Health Benefits Bureau. Employers are periodically requested to confirm enrollments of all eligible employees to the Division of Pensions & Benefits (NJDPB). All State biweekly employees covered by the SHBP are reported for coverage through the State Health Benefits Bureau. All applications for changes in coverage and new enrollment applications must be received in the Health Benefits Bureau on the first Friday of the week following the date that the member actually receives biweekly pay. This is in accordance with the biweekly payroll date schedule produced by Centralized Payroll. Billing statements, available through EPIC, include information such as the employer identification number, employer name, billing date, payment due date, current coverage period, premium delay information, and amounts due - past, current and total. Separate bills for active employees and eligible retirees are available each month. In order to guarantee continuation of coverage for all employees, payment must be made through the Transmittal Electronic Payment System, or TEPS, by 15th of the month of coverage unless the employer has enrolled in the Premium Delay program. The SHBP/SEHBP will bill Local Group employers each month for the complete cost of health benefits coverage and, if the employer elected to join the State program, for prescription drug coverage for its employees and their eligible family members. The SHBP/SEHBP will also bill for health benefits coverage of eligible retirees, if the employer has opted to pay for them. The employer is responsible for collecting any required employee premium share, including payments for coverage during a leave of absence. The employer is also responsible for maintaining any separate accounting for employee payments that it deems necessary. If a past due amount has been paid, but was not received by the SHBP/SEHBP before the bill was calculated, the employer may make adjustments and remit the corrected amount due through TEPS. All State Monthly Group employers (all State colleges and universities, Palisades Interstate Park Commission, N.J. State Library, N.Y.-N.J. Harbor Commission, N.J. Commerce and Economic Growth Commission) will be sent a billing statement each month from the SHBP for the complete cost of their active employees' health benefits, dental coverage, and prescription drug coverage. The total cost listed in the billing statement for each program is only for informational purposes, as funds for the State share of the premiums are provided to the SHBP by the State Office of Management and Budget. The employer is responsible for collecting any required employees' contributions, such as the health benefits premium shares, the 50% dental premium employee share, and leave of absence payments. Each biweekly pay period, the SHBP will provide the State Centralized Payroll with the complete cost of health benefits and dental and prescription drug coverage. The State Centralized Payroll is responsible for collecting, through payroll deductions, any required employee contributions, such as the medical plan premium share and the 50% dental employee share. Centralized Payroll will collect premiums due from payroll benefits administrators or clerks for all employees required to pay premiums when employees are on leaves of absence and off the State payroll. Centralized Payroll will initiate the transfer of funds from the State of New Jersey General Fund account to the corresponding bank accounts for each of the benefits programs. A breakdown of all fund transfers is to be provided to the SHBP. 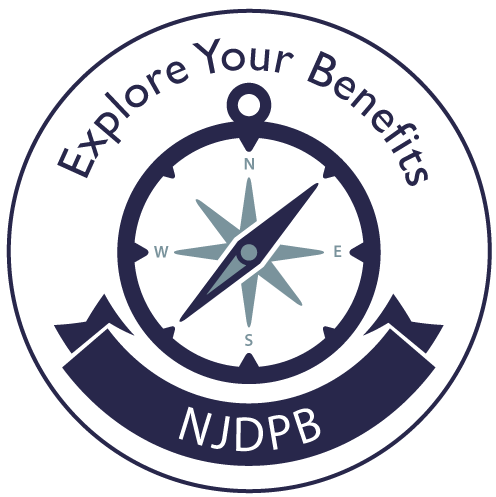 The New Jersey Division of Pensions & Benefits (NJDPB) will deduct from monthly pension allowances the cost of health benefits coverage for any State or local retiree who is enrolled in the SHBP/SEHBP, but is not eligible for local employer-paid or State-paid health coverage. If the retirees do not receive a pension allowance from the NJDPB or the allowance is insufficient to cover the premium, the SHBP/SEHBP will send them a monthly bill. The bill includes the retiree's name, identification number, payment due date, billing date, current coverage period, and amounts due—past, current and total. The lower portion of the bill is a payment stub, which includes the return address, that should be returned with the retiree's payment to the SHBP lockbox account maintained by the Division of Revenue (mail to: New Jersey Division of Pensions & Benefits, Health Benefits Bureau, P.O. Box 653, Trenton, NJ 08646-0653), in the window envelope provided. Payment is due on the 15th of the month of coverage and is payable to the New Jersey State Health Benefits Program (NJSHBP) or School Employees’ Health Benefits Program (NJSEHBP), as applicable. Upon retirement, part-time State employees and part-time faculty members who are enrolled in the SHBP under the provisions of P.L. 2003, c. 172 (Chapter 172), are permitted to enroll in retired group coverage, provided that they continue to pay the full cost of their retiree coverage. The NJDPB will mail the eligible employee a monthly bill for the cost of the coverage selected by the employee. The bill includes information such as the member's name, Social Security number, billing date, payment due date, current coverage period, past and current amounts due for each of the programs in which the member is enrolled, and the total amount due. The lower portion of the bill is a payment stub, with return address, which should be mailed with the member's payment in the window envelope provided, to the SHBP lockbox account maintained by the Division of Revenue (mail to: New Jersey Division of Pensions & Benefits, Health Benefits Bureau, P.O. Box 653, Trenton, NJ 08646-0653). Payment is due on the 15th of the month of coverage and is payable to the New Jersey State Health Benefits Program (NJSHBP). A member or dependent of a member eligible to enroll under the provisions of COBRA (Consolidated Omnibus Budget Reconciliation Act of 1985) for the medical benefits and/or the dental, prescription drug, and vision care programs, will receive a monthly bill. The bill includes information such as the member's name, identification number, billing date, payment due date, current coverage period, past and current amounts due for each of the programs in which the member is enrolled, and the total amount due. The lower portion of the bill is a payment stub, with return address, which should be mailed, with the member's payment, to the SHBP/SEHBP lockbox account maintained by the Division of Revenue in the window envelope provided (mail to: New Jersey Division of Pensions & Benefits, Health Benefits Bureau, P.O. Box 653, Trenton, NJ 08646-0653). Payment is due on the 15th of the month of coverage and is payable to the New Jersey State Health Benefits Program (NJSHBP) or New Jersey School Employees’ Health Benefits Program (NJSEHBP), as applicable. Under the provisions of P.L. 2005, c. 375 (Chapter 375), as amended by P.L. 2008, c. 38 (Chapter 38), certain over age children may be eligible for coverage until age 31. When Chapter 375 coverage is elected the covered parent will be billed directly for the cost; therefore the covered parent is held responsible for the payment of the Chapter 375 coverage. The bill includes information such as the child's name, identification number, billing date, payment due date, current coverage period, past and current amounts due for each of the programs in which the child is enrolled, and the total amount due. The lower portion of the bill is a payment stub, with return address, which should be mailed, with the member's payment, to the SHBP/SEHBP lockbox account maintained by the Division of Revenue in the window envelope provided (mail to: New Jersey Division of Pensions and Benefits, Health Benefits Bureau, P.O. Box 653, Trenton, NJ 08646-0653). Payment is due on the 15th of the month of coverage and is payable to the New Jersey State Health Benefits Program (NJSHBP) or New Jersey School Employees’ Health Benefits Program (NJSEHBP), as applicable. When an employer, retiree, or COBRA member remits an amount that is more than the required payment, the overpayment will be credited to the account and will be used to reduce the following month's total payment due. If a direct refund is desired instead of the payment application to the following month's bill, a request in writing should be forwarded to the SHBP/SEHBP. When there is a payment shortage of an employer bill for an active employee that is not paid during the 15-day grace period for that bill, a past due amount plus an interest penalty for the payment shortage will be included in the following month's bill. Interest is calculated at the rate of 1 percent above the average rate of return on State Cash Management Fund investments for the most recent fiscal year. There is no interest charged for payment shortages on an employer's retiree bill, an individual retiree bill, or a COBRA member bill. An interest penalty is added to the employer bill for employees when payment is not received within 15 days of the due date. Interest is calculated at the rate of 1 percent above the average rate of return on State Cash Management Fund investments for the most recent fiscal year. The State Health Benefits Commission and School Employees’ Health Benefits Commission allow participating local employers the option to elect a 30- or 60-day delay in remitting payments for their active employee bills. The local employer is required to complete a premium delay resolution form provided by the SHBP. The premium delay will be effective on the first bill 60 days after the resolution is received by the SHBP/SEHBP. If an employer with a premium delay terminates from the program, all premiums become due and payable before the termination effective date. If a retiree fails to pay the required premiums for two consecutive months, coverage will be terminated. A letter notifying the retiree of pending termination is sent to the retiree when payment is late, and a second notice is given if no response is received. Coverage may be reinstated if the retiree pays the premium in full within a reasonable time (two to three months). If the retiree contacts the Division of Pensions & Benefits, Health Benefits Bureau Retired Group, and pays all premiums owed to date, coverage may be reinstated. Each case is handled separately, and the date of reinstatement depends upon the circumstances that caused nonpayment (i.e., illness, incapacitation, etc.). If the local employer opts to pay for retiree coverage under the provisions of P.L. 1999, c. 48 (Chapter 48), and establishes conditions that the SHBP/SEHBP can program for, the SHBP/SEHBP will bill the employer for the retiree benefits. If the Chapter 48 resolution adopted by the employer cannot be programmed by the SHBP/SEHBP, then the full cost of coverage will be deducted from the retiree's pension allowance, or the cost of coverage will be billed to the retiree. The employer must then establish procedures to reimburse the retiree for the coverage it has agreed to provide. Prior to P.L. 1999, c. 48 (Chapter 48), local employers had the option of offering Chapter 88 and Chapter 436. P.L. 1974, c. 88 (Chapter 88) allowed local employers participating in the State Health Benefits Program (SHBP) to pay the premium charges for certain eligible retirees and their dependents and to reimburse such retirees and their spouses covered by the SHBP for Medicare Part B premiums. The employer who elected to adopt the provisions of Chapter 88 would be required to pay the premium or periodic charges for the benefits provided to all eligible retired employees and their dependents covered under the program. Eligible employees must have retired with 25 years or more of service credit or on a disability retirement. P.L. 1981, c. 436 (Chapter 436) extended Chapter 88 to include surviving spouses of eligible, covered retirees. Although this is still an option, most employers seeking to pay for retiree benefits choose to offer benefits through Chapter 48, as it offers more flexibility to the employer. P.L. 1987, c. 447 (Chapter 447) provides that the State shall reimburse retirees of the State Police Retirement System (SPRS) and their spouses who pay the full monthly premium charges for Hospital Insurance (Part A) under the Federal Medicare Program. A claim form is provided by the SHBP to the retiree, who is required to complete and submit the claim form at the end of every quarter. Proof of payment made to the Federal Medicare Program for Part A coverage, such as copies of the canceled check or check stub, should be included when submitting the claim form to the SHBP. The reimbursement is paid three to four weeks after the completed claim form is received by the SHBP. School board or County college employees enrolled in the PERS or ABP who retire with 25 or more years of service credit, or who retire under a Disability Retirement. Part B reimbursement is added directly to the retirement allowance of those retirees who are members of a State-administered pension fund. When a member receives a retirement allowance from a non-State-administered pension fund, a check from the SHBP/SEHBP is automatically mailed to the retiree between the 1st and 15th of the month. Non-State-administered pension funds include the Alternate Benefits Program (ABP), Rutgers retirees covered under the Federal Employees retirement system, NJIT retirees receiving Prudential annuities, UMDNJ retirees of the Employees' Retirement Fund of the City of Newark, and the Board of Education Employees' Pension Fund of Essex County. When retroactive Medicare enrollment coverage is processed, the reimbursement for prior months will be added to the retirement allowance or the monthly check paid to the member. Retroactive Medicare reimbursement is limited to a maximum of 12 months. The amount of Part B reimbursement paid to State retirees who attained 25 years of service or retired under a Disability Retirement after July 1, 1997, is subject to a monthly maximum amount of $46.10 per member, or $92.20 for a member and spouse when both are on Medicare, based on union contracts or regulations in effect at the time the member qualified for the reimbursement in retirement. This level of reimbursement may change over time. Local employers who have agreed to reimbursement of Part B Medicare premiums to their retirees are responsible for establishing their own procedures to do so. Retirees who qualify for reimbursement of the full cost of Medicare Part B and Part D coverage from the State of New Jersey and paid more than the standard monthly Part B and Part D premium during the previous calendar year may be eligible to receive a check for the unreimbursed balance. The SHBP/SEHBP sends notice each February to retirees advising them to send verification of the extra amount paid during the prior year. The retiree must forward the requested information in order to receive a reimbursement check. Failure to forward the requested information by the filing deadline will result in total rejection of the request. The SHBP and SEHBP are required to contract with independent actuaries to provide consulting services to the program. Seven months prior to the effective date of the new plan rates, all participating claims administrators and insurance carriers are required to submit their rate proposals to our consultants. The consultants perform a review of the claims, administrative expenses, and other financial and statistical information for each plan, prepare cost projections for current and upcoming periods, determine the adequacy of funding levels, and submit their recommendation on the plan rates for adoption by the State Health Benefits Commission and by the School Employees’ Health Benefits Commission. The Commissions hear testimony about the proposed rate actions and approves rates it deems appropriate for the SHBP and SEHBP. P.L. 1993, c. 8 (Chapter 8) provides for insurers of school districts that do not participate in the SEHBP to pay an annual surcharge to the program. The surcharge is determined by the State Treasurer and is based on a percentage of the total claims paid for the coverage of employees of the nonparticipating school districts. The surcharge is to compensate the SEHBP for the excess cost of the health coverage of the school district's eligible retirees (25 or more years of credited service in a State-administered pension fund, or retired on disability with fewer years of service), who are covered in the SEHBP. Every November 1, a survey is sent to each nonparticipating school district requesting the name and address of their health benefits insurance carrier. A response is required by the end of November. The SEHBP sends a surcharge payment request form on December 1 to the insurance carrier. The insurance carrier will complete the surcharge form and forward the form and payment to the SEHBP by December 31. The surcharge form includes information such as adjustments from prior year payment, total claims paid, the surcharge rate and the amount to be remitted.